BY RUCHI AHUJA / OCTOBER 07 2016Just how much we love our festivals! The hustle of the festive season doesn’t seem to get marred by the looming war tensions. All the brands are riding the unmistakable high tide, flooding our social feeds with offers more alluring than those of their opponents. And, here we are, being treated with ads more creative, more engaging and certainly more offer-laden than the previous year. Apparently, we’re talking only B2C here. Q: Why can’t a strong digital presence really benefit folks like OEMs (keeping their drab image aside for the moment)? A: Perhaps, because, the conversions are not apparent, the buying cycles take forever (unlike one click buy on Amazon), an entire hierarchy is involved in purchase decisions and more importantly buying is largely planned, not impulsive, in nature. But aren’t we missing something, 2016 is well past its prime and B2B is still so lean on this digital wave? Will the real manufacturers ever stand up? Hush! They are on the next wave. The truth: 2016 saw a marked departure from the earlier stand of most Manufacturing firms – big and small – that, digital marketing doesn’t concern them. B2B, although a late entrant is fast catching up with the digital race, unlike yesteryears! Here’s how Carrier did it. OEMs cannot be in the oblivion when the entire generation is only available online. Fact Facing: Research says that today’s business buyers do not contact suppliers directly until 57% of the purchase process completes! As they go about doing their groundwork, you perhaps don’t figure in that opinion forming, learning or knowledge building phase if you aren’t available in the context of these phases, digitally. And therefore, you cannot influence. The argument is clear – Whether you are an OEM, a Manufacturer or a B2B – you ought to be digitally moving. Running perhaps. Here are the real benefits that amply explain how much your digital presence can help. 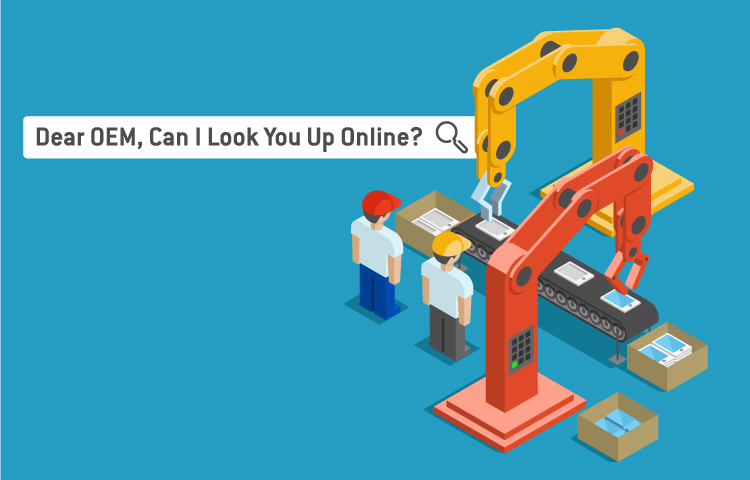 1.Get Noticed: A visit to most manufacturing companies’ websites is hard on the eye. They seem stuck in a time period. It is herculean to navigate. Precisely why most of your competitors don’t care much, you should. And, get people to check you out with ease. Conversions are a byproduct. 2. Showcase: You might be one on the biggest manufacturers of electronics components, spare parts, or appliances. Today, it is crucial that your website speaks the same. Use a good design to highlight your strengths and demonstrate the grandeur. No hard selling required. 3. Engage: As a manufacturer, you have the expertise as well as the domain knowledge. Share it. Most people come looking for it and end up contacting you; armed with the knowledge you fed them on. Helping helps. 4. Move visually: Your manufacturing facility may be working with the finest of the processes, how will that ever impress a new client or even an existing one? If you got it, flaunt it. Make a detailed video sharing more about your history, vision, processes and strengths. It just gets the viewers to trust you more. With the tidal changes fast approaching, we might witness businesses talking to businesses more digitally and more creatively. Smart. Sauvé. Now. Imagine, makers in India actually living up to the hotness of Make in India campaign. All I can say is ‘Amen’!